In Switzerland, you can buy packaged mixes for 'American Brownies' at the local grocery store. I have yet to find something here that has the word American on the package and actually resembles what I know from home, so I've never tried them. 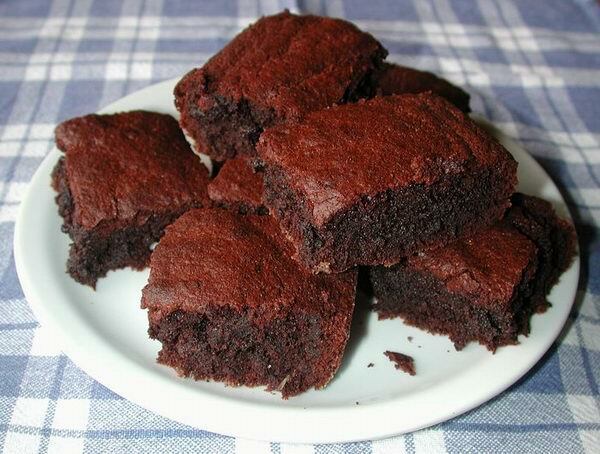 This is a basic recipe that makes very good brownies, just like I grew up with. It's also just as quick and easy as a boxed mix would have been. All but one of the ingredients can be easily found in Switzerland. The only exception is vanilla. I used pure vanilla extract (from the States). Although 'Aroma Vaniglia', found in the stores here, lists water as the first ingredient, I think it would be a close enough substitute. I don't personnaly like nuts in my brownies, but if you do, feel free to add a cup of chopped walnuts or pecans. 2. Grease and flour an 8" (20cm) square pan. 3. Thoroughly mix butter and sugar. 4. Add the eggs and vanilla and mix well. 5. Add flour, baking powder, salt and cocoa and beat by hand until well mixed. 6. Pour into pan and spread evenly. 8. Cool and cut into squares.